Last weeks picks didn’t go great, so I’m looking to bounce back with some wins for this Wonderboy vs Pettis Fight Night card out of Nashville. This week the card starts at 5pm EST, with the main card beginning at 8pm, so the main event should be done at a reasonable time. 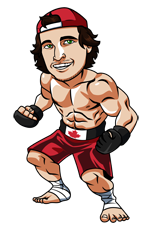 The fights can all be seen on TSN3 here in Canada. This really isn’t a very deep card, so I’m only giving my picks for the main and co-main events. This is a strange fight to make. Pettis is a career 155 pounder, who went down to 145 for a couple fights to make a run at the title. He’s now moving up to welterweight to fight Stephen Thompson. Most people considered Pettis slightly undersized for lightweight, so there will likely be a big size difference in this fight. Thompson has been clinical in his UFC career. He’s coming off a loss to Darren Till last May, which was a gift decision to Till in his hometown. It’s not like Wonderboy did a ton in that fight, but he did more than Till and almost every media member had Wonderboy winning the fight. Before that he beat Jorge Masvidal on points and had his two fight title run vs Woodley before that. Even in those Woodley fights it’s hard to say that Wonderboy actually lost those fights. I had him winning both, but they were both very close as well. Wonderboy is a counter-puncher and neither Woodley or Till would engage with him first on the feet. Both had big power and were waiting to time a big shot when Wonderboy engaged. Pettis is a different kind of fighter. He’s also a counter-puncher, but I think he will have to engage more, while also allowing Wonderboy to throw first because he doesn’t have the one punch bombs of Woodley or Till. I think this could actually be an action fight with Wonderboy using this fight to practice engaging first. I could see him racking up strikes, while also being able to keep distance and possibly getting the knockout if Pettis tries to close the distance recklessly. Overall, I still think Wonderboy is the hardest fighter to beat cleanly and convincingly in the welterweight division, and I think he puts himself back in the title talk with a big win over Pettis this Saturday. Now that Woodley no longer holds the belt, a big win from Wonderboy will shoot him into title talks along with Covington. Blaydes should bounce back with a win over Willis in this fight. Blaydes has only lost to Francis Ngannou in his UFC career, while going 6-2 including wins over Overeem, Hunt and Oleynik. He’s the real deal, he just has a hard time dealing with the sheer power of Ngannou. Willis is an athletic heavyweight, but he doesn’t have the one punch power of Ngannou, and I think Blaydes gets the better of him both on the feet and on the mat. A win here will put Blaydes right back into title discussions and he may just have to win one more after this to get the title shot back that he likely would have secured with a win over Ngannou.